Chartwells has improved lunch services and saved money in the Mt. Pleasant Public Schools. Mt. Pleasant Public Schools has seen a lot of changes in the past few years, but none so interesting as its new contract with Chartwells, a private, for-profit food service company. In 1997, the district hired Gary Allen as superintendent. When he arrived, the school board almost immediately brought up longstanding concerns about cafeteria costs, which were being subsidized to the tune of $283,000 during Fiscal Year 1997. In other words, the district was spending $283,000 more for cafeteria services than it was earning from the sale of lunches. That was $283,000 that could not be used to hire more teachers, increase their pay, or buy classroom equipment. This is not uncommon in school districts, but is a drain on precious resources that can usually be reduced or even reversed. Not only that, but most school districts conduct their accounting so that the real cost of cafeteria services is hidden in the total costs for janitorial, maintenance and other services. One reason Mt. Pleasant's school board was able to easily identify this problem is that it separates the various services in its accounting procedures so officials can see the true amount of money being spent on food service. If district janitors or maintenance crews dedicate 12 hours to cleaning or fixing the cafeteria, then these expenses are charged to "food service" on the district balance sheet. Many other districts falsely appear to be breaking even or making a profit on food services simply because they do not separate these costs in their accounting ledgers. This is why the Mackinac Center for Public Policy and other outsourcing experts have long advocated "full-cost," "total-cost" or "fully allocated" accounting for school districts and other public entities. If public officials are unable, because of antiquated or inaccurate accounting, to see how much various services cost, there's no way to see the size of the potential benefits from privatization (see Mackinac Center for Public Policy study How to Compare Costs Between In-House and Contracted Services). Before considering privatization, Mt. Pleasant challenged its district food manager to reduce the food service subsidy without outside assistance. This was accomplished by raising the price paid by the children for their lunches. The deficit dropped by $68,000 to $215,000 in 1998 and to $192,000 the following year. When the district was satisfied it was saving all it could short of privatization, it decided to release a Request For Proposal (RFP) to prospective companies to run its food service. An RFP stipulates to companies what a district (or other unit of government) is looking for when it intends to competitively bid some service. Chartwells, a subsidiary of United Kingdom-based Compass Group, which operates an office in Grand Rapids and other American cities, won a contract to manage food service for Mt. Pleasant Public Schools. Under the agreement, all employees except one remained employees of the district, complete with unchanged salaries and fringe benefits. Chartwells provided one manager to run the entire service. The American Federation of State, County and Municipal Employees union representing Mt. Pleasant's food service was unopposed to the contract because the employees could remain members of the district and the union. The result? Chartwells has saved the Mt. Pleasant district $113,000 in its first full-year as district food manager. The first $100,000 in savings came because Chartwells, being a large multinational company, can buy far bigger stores of supplies at a time than any single school district, and suppliers will charge the company less because it buys in bulk. Another $13,000 in savings was achieved simply by streamlining certain operations, such as food preparation and delivery-something the district had been unable to do as well as Chartwells. The food is better, too. Student use of the high school cafeteria is up dramatically. In fact, a survey of students indicates that they are very pleased with the privately managed cafeteria. Many students who normally walked to local eateries for lunch, now prefer to dine on the school premises, making the lunch hour a safer as well as a tastier hour of the day. In Mt. Pleasant, students can choose from a stir-fry (with ingredients chosen individually) a salad bar, or other food selections from a widely varied menu. Chartwells makes a point of creating an attractive buffet-style operation for students. 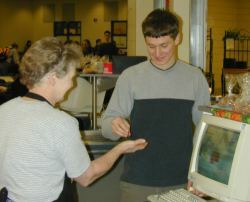 In effect, the company treats its students as customers. Chartwells knows the district would refuse to renew its contract if food quality deteriorated, or if costs got out of control. Chartwells is not the only private, for-profit firm working for Mt. Pleasant Public Schools. Service Master, Inc. is currently managing custodial and maintenance operations in the district, and has retained the district's former employees. Thomas Armstrong, business manager of Mt. Pleasant Public Schools, notes that the contract has not necessarily saved the district money, but it has been beneficial. "Service Master gives us the expertise that we could not have had with an in-house crew. It brings cleaning methods, chemicals, and a whole laundry list of skills and experience that we otherwise would not have, said Armstrong." Done correctly, privatization of school lunch services works and works well. There's no telling how much educational quality might improve-or how much money might be saved-if every school district focused exclusively on education, leaving ancillary duties such as food preparation, janitorial and maintenance operations, lawn maintenance and other duties to private-sector specialists able to perform them better and less expensively.